Are you wearing boxing gloves and fighting with the world? We are like flowers. We're either growing and blooming, or we're withering and dying. Does it look like everyone around you wants to create a fight? Do you feel like you are in a constant conflict weather with people, situations or yourself? You are not alone. Most people feel victimized, that's why we have so many lawyers in the world! I would like to share with you why this may be happening in your life and offer you a different perspective so you can shift these conflicting energies. You can do this by "reframing" what happened. Reframe means to give it a new perspective, to understand it from a different point of view. If you don't do that, the price you pay is too high. You jeopardize your wellbeing, and by doing so you are not in service to the betterment of the world either! I'm not saying you are right or wrong. I'm saying that staying in the conflict zone is poisoning to you. Understand? It's like wearing boxing gloves all the time! You may feel like if you don't protect yourself people may take advantage of you, or people may stab you in the back... so you are ready to "punch"! Here is an example of how our minds work. If I say doctors kill people, I will collect evidence that my belief is true. I can google cases of medical malpractice and prepare a petition for people to sign so that I can win my case. On the other hand, if I believe that doctors save lives, I can do the same thing and also fight to win my case. In other words, where you put your attention on, your mind will find evidence to help you win the case. This is how mind operates. It's not your fault. It's nobody's fault, it's simply how it works. So, you must understand that you are not your mind, and that your mind is just a tool for you to live in this world. Your mind is like wild horses! Your body is the wagon and you are the coachman! If you don't control those horses they will break the wagon and throw you on the ground! No matter what you believe, your mind will look for evidence to prove it's right, and to fight. The reason this happens is because we were programed since small ages to defend ourselves, to compete, to win the game.The thing is that there is no game! Life is a series of experiences and you are here to live these experiences! I would like to invite you to drop your boxing gloves and reflect upon times when you started to make assumptions about someone or something and these assumptions became your truth. Perhaps you had arguments with someone, or you broke up a relationship , or felt so helpless that you had to call others to help you through the fight. Watch this video, where I'm helping my client Susan Pixley to recognize the conflicting energy that has been stoping her to create the life she would love to live. This is part 3 of the Energy Leadership Assessment Debrief that I provide to my clients before coaching sessions. It reveals how your attitude is impacting the unfolding of your life's stories. I hope this video helps you reflect and reframe any conflicting energy you may have in your life right now. Sunrise and Sunset Vortex Hikes, Talisman Making and Vortex Dance. 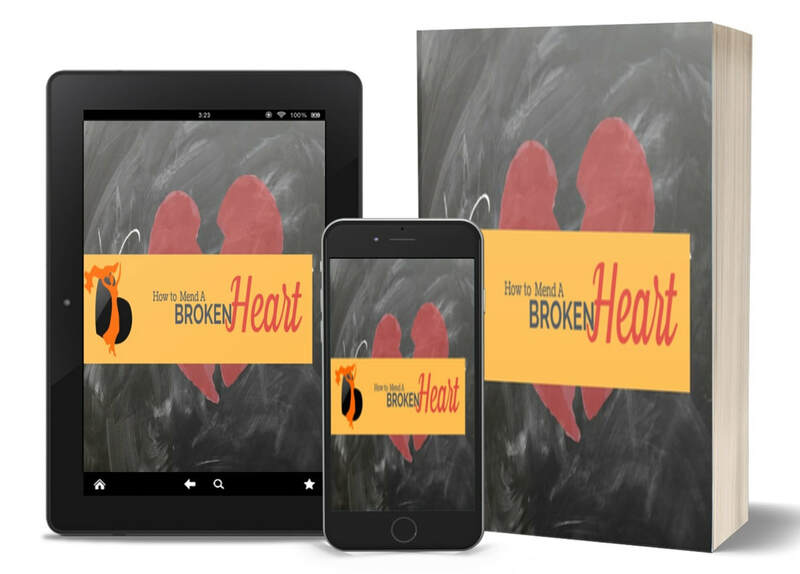 Download my e-book - How To Mend Your Broken Heart - it's FREE! Are you Carrying a Love shield? Everything looks wonderful in social media. You have friends, you go to fun places, and you have nice “stuff”... but it's missing that special someone to share your life with, and it feels empty. It’s that feeling of “OMG! You become really good at coping with things like yoga, trips, staying super busy and filling up life with good stuff, but you're also overworking, over-eating, hiding, feeling lost and lonely because you're longing someone who has your back, 100%, no matter what. It’s a crossroads. Finding a truly amazing man who is an equal - a true partner, lover and best friend -- is either going to become a PRIORITY now… Or it’s time to give up and live with… "My life is good, I’m okay if I wind up alone." If you resonate with this, it's because you have what I call a "Love Shield" and it comes up because there is a part of you that is scared... Scared that a previous trauma or negative experience may repeat itself or you feel your identity is at risk. It could be about your childhood wounds that seem to never heal, or your emotional connection with the trauma as an adult that keeps you locked in fear. If you are stuck in your head, over thinking every aspect of a date, when he called last, every single word he said, you may be stuck in your head. When you are stuck in your head it means your heart is not leading. And in relationships and love, it’s all about the heart! You could be missing out on queues about how he really feels about you when you think too much. Think about one of your positive attributes. Do you over express it to the point of it becoming unsettling? Or, do you under-express it because you are scared it will be too much? These kind of things could be hurting your dating life. So What? Now What? How to Move Forward? In order to move forward you should take care to notice your judgments. How do you judge yourself? How do you judge other people? Remember your date is a human being who wants love, wants to avoid pain and wants to be happy, just like you. I suggest journaling about the negative judgments you make about yourself. Write each judgment down and then make a positive script to replace the negative. When you are on a date, collect ten pieces of positive evidence. ● What did you do well? ● What did your date do well? ● What aspects of the date went well? When you drop the "love shield", you soften a bit. It opens you up to wonderful connections and intimate relationships. To understand how your love shield is impacting how men see you and experience you... what to do to attract quality men to you instead of pushing them away - let go of self-destructive patterns, connect with men in an authentic way, stay present in the moment and be yourself. Drop off the "Love Shield" and let the moment unfold without judgement! Practice self-compassion, patience, and know that a relationship doesn't come to us "ready", but we build it together, daily, in a very loving way. How would it be like to find mr.wonderful man? Are you ready to have a relationship with Mr Wonderful man? All you have to do is to let love happen. Can you do this? The more you relax into the moment, the faster it can happen. It happened to me in 10 hours! In this webinar I'm gonna share with you everything, how it happened, from the moment I saw him to the moment we said yes to each other. It's about letting go of expectations, and become what you want to attract in a man. Can you do this? Do you know how to let go of expectations? What about becoming the person that you desire to attract? Do you know how to do this? If you are tired of trying and want to learn how release expectations and be relaxed so that you can welcome love into your life, this webinar is for you. When you become you in your totality, when you let your inner beauty come out, that's when you're ready to attract the one to your life. So, stop comparing yourself to others, trying to please or seduce... because it will only make you feel lonely, even if you are dating someone. Your uniqueness is your highest asset. Believe it! The moment you let go of trying and become present and relaxed in the moment, it's when you become special and attractive. The love you want is waiting for you to be ready for love. So, let's do this! It starts now! ​for more informations about retreats, workshops and webinars. get mr right iN 10 hours! "You can get Mr. Right in 10 hours or Less! It wasn’t always like that! I have dealt with a lot of relationship drama in the past. Nothing was working. I would jump from one relationship to another eager to find Mr Right, and every time I only had disappointments. All my suffering brought me to dive in an intensive self-inquiry, numerous workshops and classes that prepared me to become a magnet to attract not only Mr Right, but all the things that I have always desired – the home of my dreams where we live now in Sedona. I studied to understand how the mind works, I became a professional life coach through a renowned school in America, and I went to England for extensive training. As a result, I was able to retire from my full time job, and dedicate my time to coaching and to inspire people just like you. I can assure you it wasn’t lucky! I can say that there’s a formula, a way of thinking and perceiving things that can guide you to fulfill your dreams too - find your happiness, find companionship, find real love and intimacy. You say you want to find love, but do you have time for love? Look at your agenda. Does it have space for someone in your life? Sometimes we think we are ready for love, but subconsciously we sabotage ourselves. I would like to invite you to come to my FREE webinar where I will share with you my story about how I met my Mr Right in 10 hours, and more tips on how to heal your heart and become ready for love.